Fort Osage School District in eastern Jackson County has recently added a lot of traffic to its Internet highways. If you continue with this analogy, then the 6,000-student Fort Osage School District in eastern Jackson County has recently added a lot of traffic to its Internet highways. In the past year and a half, Fort Osage has given all its 7th, 8th, and 9th graders Chromebooks, placing nearly 1,300 new mobile devices on the district’s network. Fort Osage Director of Technology Debbie Smith says she could see an impact immediately. After that ‘aha’ moment, Smith says, she negotiated with MoreNet, the district’s Internet service provider, for more bandwidth. (This is like adding more lanes to the highways.) The district more than doubled its connection speed from 100 megabits per second to 250 megabits. Smith says the new speed has proven more than adequate to the district’s needs. “There’s only been a couple of days that we’ve seen it even get close to that 250 megabit level,” she says. Fort Osage now is well-positioned to continue to grow its network. Smith says the district’s fiber cables can handle one gigabit speeds and faster. This puts the district well in line with the Federal Communications Commission’s current and future recommendations for bandwidth for schools. The FCC recently set a target that by 2018, school districts should be able to provide an Internet connection speed of one gigabit-per-second for every 1,000 students. That’s a ten-fold increase over the FCC’s current recommendations. And while Fort Osage may feel secure, across the state line in Kansas City, Kan., Joe Fives has some advice. “It almost seems like you can’t have enough,” he says. Fives is Director of Technology for Kansas City, Kansas Public Schools. KCK began giving laptops to its high schools in 2007. Now, Fives estimates there are more than 20,000 mobile devices being used on the district’s networks during any given school day. “There’s just so much riding on the network. It’s so critical,” says Fives. Like Fort Osage, KCK runs most of its network on fiber cable. The district leases its cable from Time Warner and funded the cable’s installation largely through the FCC’s E-Rate program. E-Rate gives subsidies to districts with higher-than-average percentages of low-income students. 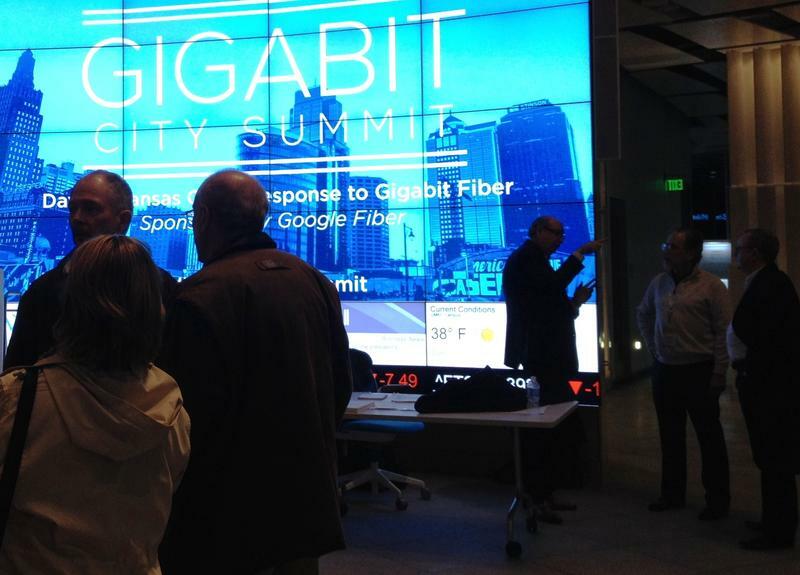 In addition, the district recently got a boost from the installation of Google Fiber in Wyandotte County. This saves the district’s bandwidth and saves KCK money. It turns out, this type of cost-savings is good practice. According to Evan Marwell, the CEO of the San Francisco-based ed tech advocacy non-profit EducationSuperHighway, many districts do not consider how to get the best deal on their networks until it is too late. “Those districts with sufficient broadband are almost always on average paying one third of the districts that do not have that faster broadband access,” Marwell said. In KCK’s case, Fives said the district paid ten cents on the dollar for its fiber cable using the FCC’s E-Rate program. Not all districts appear to be so frugal. EducationSuperHighway recently did a study of 100 Kansas school districts and found that, in general, they paid $14 more per megabit than the national average. CEO Marwell said many districts often lack the expertise and experience to trim costs effectively. Additionally, districts often do not negotiate enough with their Internet service provider. David Liss, the chair elect of the board of the Missouri Education Technology Leaders, said service providers will often not give districts dedicated Internet connections — that is, connections devoted solely to a district’s usage. “Call them [Internet service providers] on it. Districts need to get the services they pay for,” he said. Yet, all this talk of megabits, contracts, connection speeds, and fiber cable should not obscure what is a district’s main duty: educating its students. “The real magic happens in the classroom,” Liss said. Debbie Smith, Director of Technology at Fort Osage, says technology, when used smartly, enhances schoolwork. But when technology is not coupled with fast, reliable Internet, she says the results are counterproductive. Two years ago, metro-area entrepreneurs started buying houses in the first Kansas City, Kan., neighborhood to get Google Fiber. They wanted to take advantage of the ultra-fast Internet as they launched new ventures in what quickly became known as the Kansas City Startup Village. The plan was to create a community of entrepreneurs on either side of State Line Road. But because the two states have different economic incentives for new businesses, many entrepreneurs gravitated toward the Kansas side of the Startup Village.